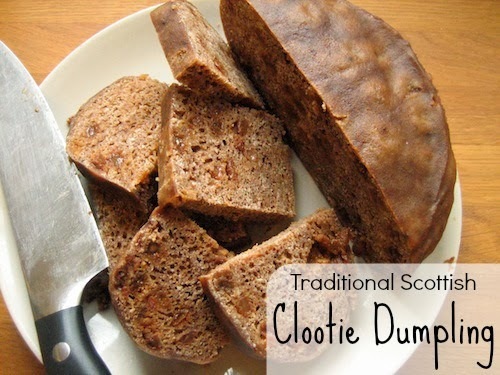 Our Handmade Home: Dry Rot - Victory Over Our Arch Enemy! 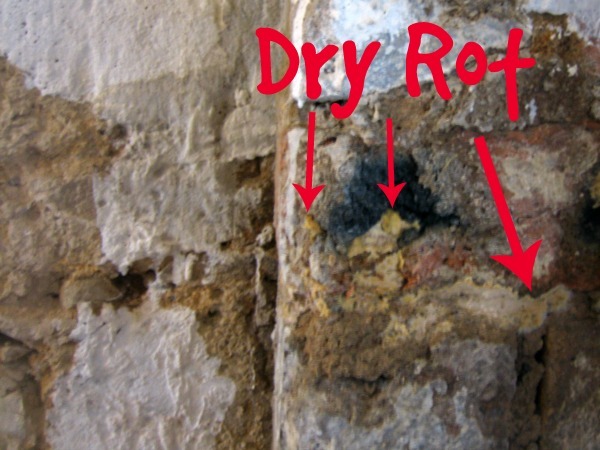 Dry Rot - Victory Over Our Arch Enemy! 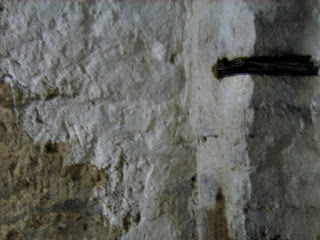 Within a few months of moving into Snowdrop Cottage (back in 2007) we found dry rot in the front wall of the house, it was horrendous and scary. The whole front of the house needed stripped back, sprayed and re-roofed... It was pretty much the start of our journey to hell and back with this house. So imagine my joy when, on returning from a nature walk with the kids a few weeks back I found this on the wall in the lobby. I recognised it as dry-rot immediately and panic set in. It was a tiny amount, though it can spread rapidly. I'll admit to sitting on the kitchen floor in tears, before picking up the phone. Our friend, (who happens to be a damp and restorations expert) came round within the hour and gave me the advice we needed to fix the problem ourselves. 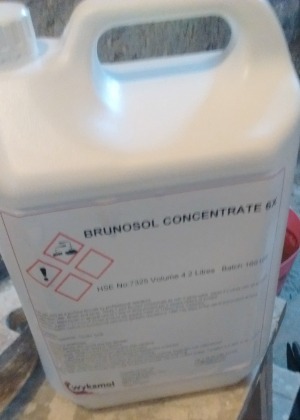 A quick ebay purchase and couple of days later the chemicals we needed arrived. 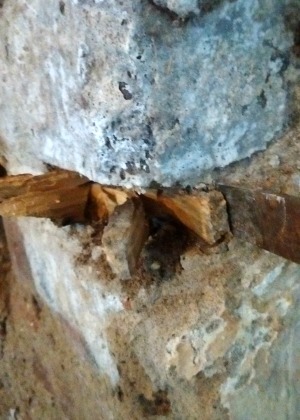 I chiseled out the wood from the wall - I think they are called 'nailing blocks' - they are pieces of wood built into the structure of the wall for nailing something to, in this case a door frame. The fronts were fairly solid and dry but as I got further in, it was clear there was our problem. Rotten and brittle, by the very back I was pretty much just scraping out dust. I also scraped all signs of rot bloom from the wall. and burnt all the bloom and wood to get rid of it instantly. With all the wood and bloom removed I got dressed to the nines - I was warned DO NOT GET THIS ON YOUR SKIN, I was taking no chances. I made up some of the concentrate and applied it liberally to the wall with a paintbrush, I got right to the back of the nooks that I had just removed the wood from, and painted it on 2ft+ in all directions from where the blooming had been. I only needed a tiny amount of the concentrate. Then I packed the gaps in the walls with slate, as I had been told to. 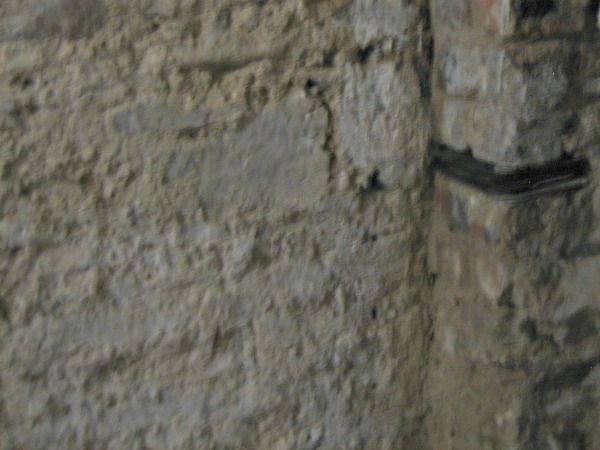 Slate is used as a damp-proof course and does not compact under pressure, which is why you use it to fill gaps in walls. The photos are pretty bad, but it looks much better now and no fungus! The stink of the chemicals took me right back to that horrible autumn of 2007 but I am so grateful I was able to do this myself this time round. Before the lobby is finished I will give this section of the wall 2 more applications of the Brunosol. When spring comes around we need to make some alterations to the wall outside to stop moisture penetrating here. The chemicals I used are for treatment of dry rot in masonry - we got them on eBay from Platinum Chemicals cost about £45 including delivery. 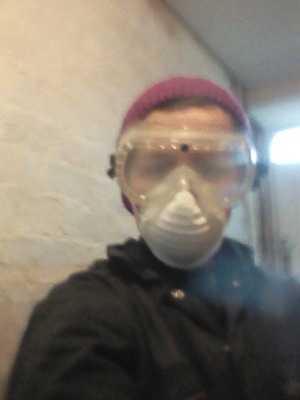 I wore overalls, rubber gloves, a hat, dust mask and oversized safety goggles to protect myself. I was very careful not to splash the stuff around. If you are in central Scotland and have problems with damp, rot or woodworm contact Russell Preservation - I cannot recommend them highly enough.